INNISBROOK, FL – With the goal of providing solutions to the challenges and concerns of corporate America, three Bay Area entities have collaborated resources to create the Innisbrook Leadership Institute. Under the umbrella of the Institute, Innisbrook Resort and Golf Club, the University of South Florida and ActionCOACH will assist organizations in maximizing performance, optimizing growth, and meeting the demands of today’s challenging economic environment. Based on the 900-acre campus of Innisbrook, The Leadership Institute offers an exciting new series of customized leadership development programs based on the strategic needs of each respective organization. An award-winning team of business coaches and educators assist organizations in developing a theme, creating an agenda based on the company's unique goals, arranging speakers, facilitating the event and even creating post-meeting follow-up. Planners can focus on building content and dynamic leadership training, and leave arrangements of meeting space and accommodations to the dedicated conference liaison. To formally launch the Institute, an inaugural CEO Roundtable Forum was held at Innisbrook on June 12 with the support of the 2,800-member St. Petersburg Area Chamber of Commerce. The forum was designed to give the Bay Area’s top executives the opportunity to learn about this new initiative and to provide input on the types of programs they would find most useful to help their businesses thrive in tougher times. 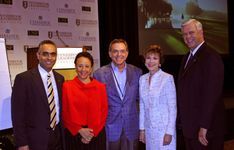 Speakers included USF President Judy L. Genshaft, PhD, St. Petersburg Chamber of Commerce Board Chairman and Tech Data Chairman Steven A. Raymund, and Johnson. A white paper derived from the roundtable discussions is available here, and will soon be uploaded to the Institute’s website, www.thinkinnisbrook.com, as well as the St. Petersburg Chamber’s site at www.stpete.com. “From experience, I understand that transformational leadership accelerates success, reduces cost, and enables organizations to thrive in tough times,” said Raymund. Raymund’s sentiments were echoed by Genshaft, whose staff of PhDs from USF’s Center for Transformation and Innovation will provide some of the stellar instruction available to Institute clients. 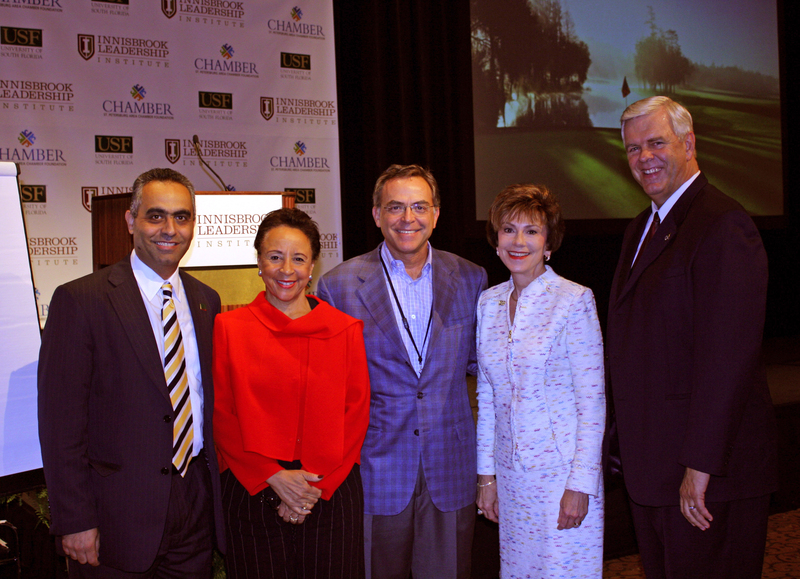 To learn more about the Innisbrook Leadership Institute, visit www.thinkinnisbrook.com or call Institute CEO John Lankford directly at 727-942-5205. Situated on 900 wooded acres of rolling hills and 70 acres of lakes in the St. Petersburg/Clearwater area on Florida’s Gulf Coast, Innisbrook Resort and Golf Club is located just 25 minutes from Tampa International Airport. Recently and completely renovated by Owner and Management Company Salamander Hospitality, Innisbrook features 72 holes of championship golf, 608 spacious guest suites and rooms, four restaurants and three bars, the Innisbrook Golf Institute, 11 tennis courts, the new full-service Indaba Spa with 12 treatment rooms and fitness center, six heated swimming pool complexes, a nature preserve, and three conference halls with 65,000 square feet of meeting space. Innisbrook is a member of the Preferred Hotels & Resorts and Preferred Golf programs. For additional information call (727) 942-2000 or visit www.innisbrookgolfresort.com. Ranked by Entrepreneur Magazine as the #1 Business Services Franchise in the WorldSix years in a row, ActionCOACH has more than 1,000 offices in 26 countries. Relying on proven tactics and existing strategies to maximize individual potential, ActionCOACH uses a combination of business coaching and executive coaching to create a multifaceted framework for improving efficiency and profit. By fusing powerful marketing, business and team building strategies ActionCOACH clients have had dramatic improvements in revenue and profitability. Business coaching and executive coaching is an organic process that involves using proven techniques combined with personal commitment and accountability for business owners and executives to address their current and future situations. The ActionCOACH Pinellas team is comprised of an award winning group of coaches with extensive experience as corporate executives and entrepreneurs and a proven track record of results for clients. To learn more, go to www.actioncoachpinellas.com.